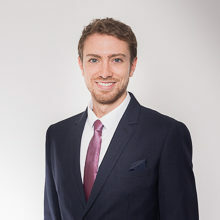 Jérémy Falquet joined LALIVE as a trainee in July 2018. Jérémy Falquet holds a Bachelor and a Master of Law, as well as a Certificate in Transnational Law (2017) from the University of Geneva. He also holds a Certificate of Advanced Studies in Legal Professions (2017) from the University of Geneva. He is currently preparing the Certificate of Advanced Studies in mediation at the University Institute Kurt Bösch, in partnership with the University of Geneva.